What do you do when your child has outgrown a most favorite article of clothing? As a mom, I want to keep it around a while longer, until that child can let it go more easily. 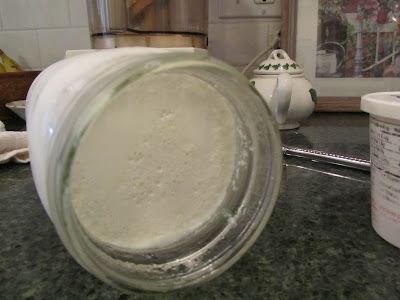 So, what's a mom to do? Here are three examples of how I extended the lives of clothing items, one for each of my three children. Julia bought this jumper with a gift card in late elementary school. She wore this practically everywhere. When new, the denim was fairly dark. You can see it has been through the wash many, many times. The skirt of the jumper originally had a plain hem (no ruffle). When the jumper was getting just too short to wear, I told Julia to give me a day to think on it. What I came up with was a denim ruffle to add to the hem. The denim was scavenged from old jeans. (And at the time that I made this revision to her jumper, the scavenged denim matched the color of the jumper denim.) I cut several pieces about 6 inches wide by as long as I could find, and sewed all these pieces together. What I wound up with was one very long piece (3 times the measurement of the circumference of the hem of the jumper) by 6 inches wide. I hemmed one of the long edges. Then machine basted along the other long edge. The machine basting I used to pull/gather that edge, to make a ruffle. I pinned it to the hem of the jumper and machine stitched the two together. In total, it took me about 1 1/2 hours. Grace found this skirt at a church clothing swap when she was about 12 years old. 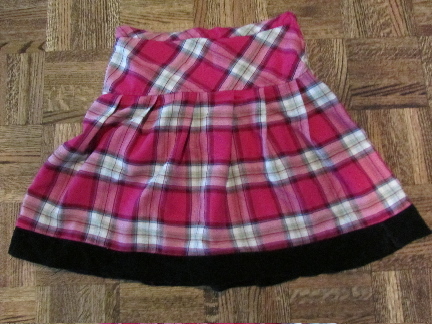 Originally it was just the plaid skirt, no black hem trim. When it became too short to wear to school, I told Grace that I'd come up with something, as I knew she loved this skirt. I went looking through my scrap box and found the remains of two black velvet dresses, size 4T, from Julia and Grace's preschool years. I had previously used much of these dresses for fabric for our Christmas tree skirt (Victorian crazy-quilt style), but there was still enough for me to cut a 3-inch wide strip, just long enough to edge the skirt. I hemmed this black strip, let down the hem of the skirt (so I would have as long a skirt as possible, as well as single thickness fabric through which to sew on the black velvet), then attached the velvet to the skirt. I also had some black velvet ribbon with which I made a bow that she wore pinned to the waist, and off to one side. This took about 1 hour. When my son, Chris, was a boy, he wore flannel shirts everyday. He had one in particular that he loved. When this shirt became too small, I didn't want to just give it away. So I decided to make it into something that he could hang on to. 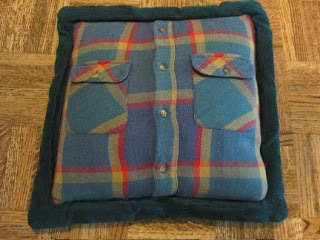 I made this shirt into a covering for a throw pillow. 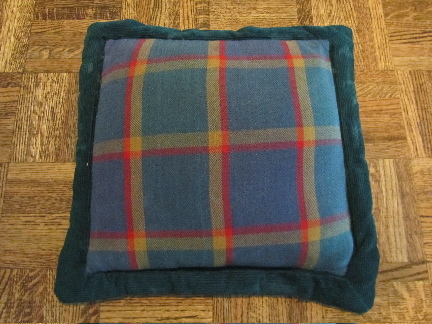 (I had an old throw pillow not being used). I based the measurements on the throw pillow itself, and cut a piece from both the front and back of the shirt. I had some scraps of green corduroy fabric, leftover from making a bedspread for Chris's bed. I used these scraps to sew a flanged edge around the pillow (so the pillow would coordinate with the spread). The front of his shirt made a nice back to the pillow. The buttons allow me to take the cover off for laundry, as needed. The pillow took about 2 hours to make. Julia's jumper is now in the giveaway pile, Grace still wears her skirt, and Chris's pillow is still in his room. But when they were small, it was important to each child to extend the lives of these much-loved articles of clothing. Love it, especially the cushion! My daughter is desperately hanging onto and wearing a pair of pyjamas that are waaaaay too small and make us laugh every time we see her gangly pre-teen legs and arms sticking out of the sleeves and bottoms! They're so faded and thin, I'm not sure I could make an object of beauty out of them! Perhaps not something she'd still wear, but what about a cute little stuffed animal, or PJs for a favorite stuffed animal she already has? 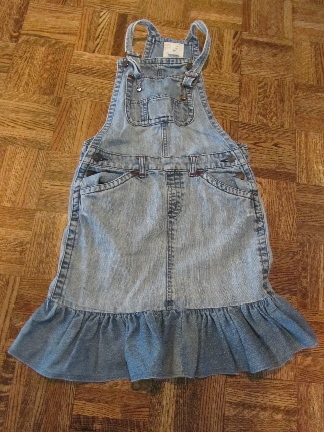 I once made a pair of overalls out of too small clothing, for a stuffed rabbit one of my kids had. I think we still have him. Now that it's summer, think of the very thin pyjamas as "summer" jammies! Your daughter's pyjamas reminded me of some footie jammies my daughter wore for years and years. She would not let them go. We cut the feet off at one point, and eventually she split some seams. Good idea! She's at the age where she could do the making! There are 50 free patterns here, and many look easy enough for a beginner to try, with a bit of your help. Have fun with it! If your daughter does sew something, post a picture of it on your blog so I can see! Thanks again for fixing my jumper, Mam! 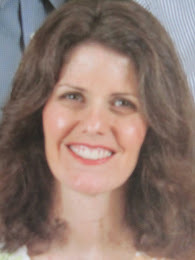 I just wanted to say that, once my jumper got its ruffle, I loved it and wore it even more than I did before--WAY more! It might even still be useful for dress-up and drama skits. The addition was the best!